AND ITS PROBLEM WITH SEATING "FOREIGNERS"
Subject: AIR-DO and its treatment of "foreigners"
Hello Hokkaido International Business Association Mailing List and Friends. http://www.airdo.co.jp/) and its treatment of people it considers "foreign". Japanese. I was then asked what seat I would prefer. I said, "The seat by the emergency exits, so I can have more legroom." the center aisle) would be okay. I said no, as the bulkhead would be in my way. I reiterated my preference. take it up with the proper authorities. I got my preferred seat. of customer relations at AIR-DO, with more apologies. 1) The ground staff were not intentionally discriminating against me. 2) The manual states that all foreigners (he even used the word "gaijin"
here) must be given special consideration in the case of emergency seats. bulkhead seat. Not once, but twice. following flight manuals, which lead us to point number two. the airline as a whole, his attitudes were quite disappointing. fly them. I certainly would choose another airline from now on. AIR-DO seems oblivious and intransigent to changing times. with how I approached this issue. Fine. I'm used to that. tendencies if it wants to remain aloft. Readers of my emails may remember early October, when I brought up an issue concerning local airline AIR-DO (http://www.airdo.co.jp/): On September 25, when boarding the 8:10 flight for Tokyo, AIR-DO's ground staff saw me as a foreigner with a language problem (despite a problem-free check-in in Japanese), and, despite my request for a seat by the emergency exits (available, with more legroom), I was thrice steered to a more-cramped center-aisle bulkhead seat in front of the screen. Although a seemingly small matter, I considered this poor customer sevice. I disliked the airline's attempts to deny my seating preference for no other reason but my physical appearance, not to mention wilfully mislead me about the quality of a different seat. So, like any customer with a complaint, I called AIR-DO's head office (011-252-5533) for a chat. this would not happen again. Well, guess what. It did happen again. When I was giving a presentation on naturalization at JALT on November 24 in Kokura, Kyushu, a reader of my emails asked me whether it was worth naturalizing if I still get gaijinized time and time again, like recently on AIR-DO. I tried to counter that after raising the issue with gaijinizers, they do change their ways, never fear. However, in attendance was a Mr Anthony S. Collins, who raised his hand and said AIR-DO had just done it to him. The fact that his treatment was procedurally exactly was the same as mine indicates a pattern, meaning AIR-DO in fact has a policy towards foreigners to give them inferior seats (unlike any other Japanese airline I've flown--ANA, JAS, or JAL--which does sometimes ask if you speak Japanese or would be willing to assist, but never steers you away or lies about legroom). There is no MoT regulation on seating non-Japanese in the emergency-exit seats. In fact, according to Mr Yamano, there are no MoT guidelines on emergency seating at all--it is left up to the airline. 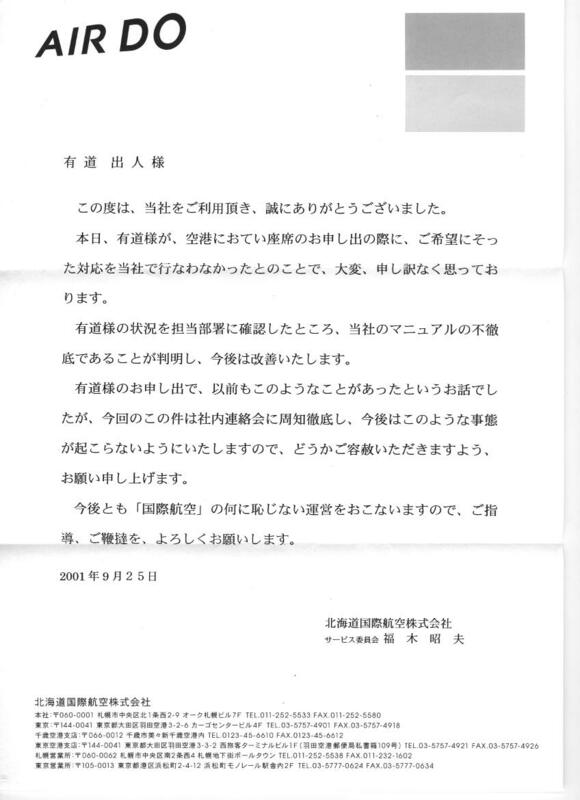 Having called AIR-DO to investigate, MoT noted that Mr Fukuki said he had apologized in writing to me, had issued an internal memo, and wanted to know the name of the newly-gaijinized passenger so he could apologize to him too. Mr Yamano added, in a conversation with AIR-DO's Soumu Buchou Mr Tanaka, that Mr Tanaka said this third occurrence was probably a counter staff member individually freaking out (enryo shiteru) at a foreigner and throwing a seat at him (though this reaction seems too methodical to look like a matter of panic; and anyway, Mr Collins is a black-haired, olive-skinned gentleman who looks more Japanese in his law-firm attire than most Japanese twenty-somethings). I said no, and told him that these incidents probably constituted an unfair policy. It ignores individual language ability, assuming that people who look foreign cannot assist in emergency procedures (although for the life of me I can't see what the heck someone would have to do in an emergency other than open a heavy door and shoo people out). Moreover, AIR-DO seems to be unable to keep its word and quit it. Three strikes, in baseball at least, constitutes an out. Messrs Yamano and Akema said they understood the problem and yes, could not condone this practice. So I asked for MoT to send a written caution to AIR-DO to tell them to rescind this policy. He said that this would be considered, but telephoned warnings have already been issued. Before it was just the ignorance of a startup airline. Two years ago, when I raised the issue, my complaints clearly fell on deaf ears. So I took my business elsewhere with no fuss. Two months ago (I only flew AIR-DO because I had urgent business) it was stupidity. But a promise was made by the airline to change. Two weeks ago, it now amounts to a broken promise, which deserves to be known about. I accept the notion that nobody has the "right" to sit anywhere. But if the emergency seat is open and the person has no real language barrier, then why not let him or her enjoy the preference like anyone else? Assuming that a language barrier exists due to the color of one's skin, moreover despite demonstrated evidence to the contrary, is simply discrimination. No other airline has this policy. And no airline should. Even the MoT does not condone it. In my last email, I made it clear I was not advocating any action. This time though, I say that if an airline breaks its promises, people should consider whether AIR-DO is worthy of their support. I have given it plenty of my own finances and support in the past (http://www.debito.org/airdo.html), but it seems for naught. Only if people show that this silliness will result in lost sales is troubled airline AIR-DO, asking for our tax money from the Hokkaido Government to stay aloft, going to start understanding that customer preferences, even if they come from a "foreign" face, carry as much economic weight and respect as if they came from a Japanese. And that includes this Japanese.